Natural Farming is completely chemical-free and environment-friendly agriculture. 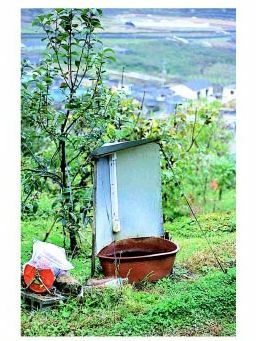 It developed a few methods for pest control such as aromatic insect attractant (AIA), fluorescent insect attractant (FIA) and fish odour method. Slit open the two sides of a PET bottle. Put in rice wine and FPJ diluted 300 times. FFJ is best for attracting insects. Install at the height of the fruits/leaves that moths/butterflies like. Install at the time when insects lay eggs. It is no use once the insects fly into the field and lay eggs before they drown in the solution. 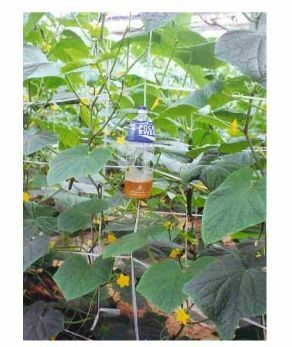 The bottles should be hung around the field, according to the height of the plants for the vegetables and for the fruit trees 4 to 6 must be hung according to the size of the tree. Bend a zinc sheet in an "L" shape. Hang a fluorescent light vertically on the corner of the sheet. Make a roof to prevent rain damaging the light. Put a basin full of water beneath the light. Add a few drops of gasoline/ Kerosene in the water to completely drown the fallen insects. During the egg-laying season of pestilent insects, AIAand FIA are installed at the height of fruits or leaves in and around the field. They are usually necessary during the peak of the reproductive growth of fruit-bearing plants and during the height of vegetative growth of leafy vegetables.